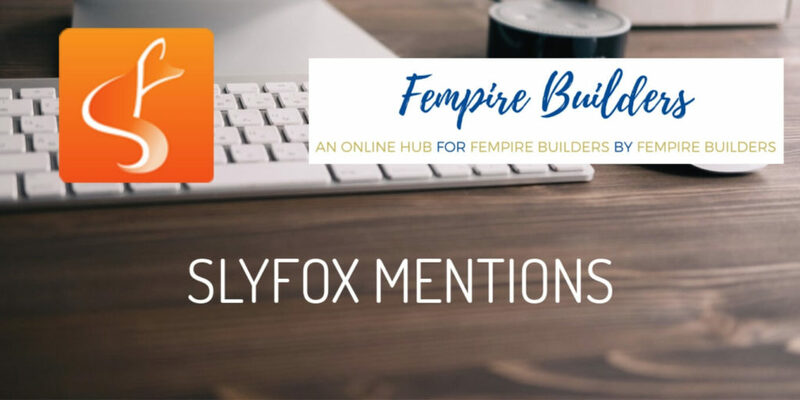 SlyFox is so happy to have been featured in Fempire Builders’ Fem Spotlights series this month! We got the opportunity to share our origin story to Fempire readers with a special Q & A session published online that covers topics ranging from sanity savers, online marketing, weiner dogs and our SocialFox, Michelle Faulds! Check out a summary and some highlights below. Fem Spotlights is all about empowerment: sharing stories that strike a chord and learning from others. This is certainly the case with many of the other features which are worth a read. The SlyFox feature cuts to the root of our business model and the motivations we have to serve the London community through online marketing. It goes beyond what SlyFox as an agency offers clients (Google Ads, Web Design and Graphic Design) to the support we give clients by investing in their services personally, cheering for them on social and communicating frequently in person. We see all sorts of business owners from every industry in our office week in and week out and it helps create a sense of community and connection to London. Below are just some of the answers our co-founder Michelle Faulds offered readers but you can read the full article here. My husband. After over 20 years in sales and marketing, I had totally burnt out and was suffering from severe depression and pain after a car accident. My business partner and husband, Mike, encouraged me to keep busy within the business. I found it became not only an outlet but an incredible passion for me. He is my biggest cheerleader and fan for sure. My “why” is to create a more fulfilling and rewarding life for myself and my family. Growing up we didn’t have a ton of money and I struggled financially for years so I wasn’t able to give a whole lot to my children. That has changed and it feels amazing. Recently my son’s dog became very ill and because of my business, I was able to, without hesitation, pay the huge vet bills for treatment. Sadly, she did not make it, but I am so pleased that I was able to alleviate this unexpected stress for my son. My business truly is my lifeline. My business, my clients, my staff; they are all like family to me. My husband is the money guy, but, for me, the relationships I am making are the real payoff. Cool websites and sales results for clients are just a great byproduct!